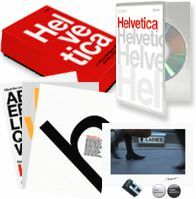 Helvetica is a classic. Helvetica is played out. Each of these statements is true to an extent. The worldÃ¢â?¬â?¢s most recognizable typeface will soon star in a new film that documents both its omnipresence and its timelessness. House Industries have a $50-off sale on until the 15th September, which includes the exceptional typefaces Chalet, Neutraface and Paperback. I wish I had enough spare cash to justify buying a set of one of these, they’re beautiful, versatile faces, and currently a bit of a bargain. NTSC Region 0, 16×9 anamorphic widescreen presentation, full-color booklet, English and German language subtitles. Release date: November 6. Pre-order now, you’ll save $5 and receive early shipping (a week before street date) and two love/hate Helvetica film buttons. There’s also a limited edition 1000-run version that includes three letterpressed mini-posters, a color C-print of a still from the film (one of ten different stills) signed by Gary, two love/hate Helvetica buttons, and a letter of actual Helvetica metal type. I’ve ordered my copy already! There are 38 more interviews like these on the DVD. Debunking Daryl Cagle’s criticism of the LA Times’s font usage. BBC News has a good overview of the new £20 note. It has to be the ugliest British banknote I’ve ever seen. The front isn’t bad but the rear, oh my, where to start with this monstrosity? What the hell is going on with that illustration in the centre? The guilloché behind it makes it far, far too busy, it makes my eyes hurt just to try and figure out what’s going on. The profile portrait of Adam Smith is remarkably ugly; look at the previous 20’s portrait of Edward Elgar and scratch your head as to why they couldn’t come up with something more tasteful. What’s going on with the stroke around the “£20” in the top right corner, and why has someone just peppered a load of EURion constellations around it with no effort to make them fit in? Cartoonist Daryl Cagle points out that the LA Times resembles a ransom note, with a staggering 22 different fonts above the fold on the front page! via Veer. Computer mag in “good design” shocker! Creative Review point out the recent redesign of German magazine PC Professionell by Spiekermann Partners. (The name may seem familiar because of famous typographer Erik Spiekermann.) It looks fantastic, eschewing the usual gaudy stock art-laden cover for a gorgeous type-driven approach. Here’s hoping it lasts!